The induction motor is a kind of AC motor in which the power is supplied by means of electromagnetic induction to the rotating device in induction motor the power is induced in the rotating device. It has a stator and a rotor like any other motor the stator carries a short-circuited wiring while the rotor carries 3 phase winding. Only the winding of stator is connected to the three phase supply by the help of the stator winding the rotor winding gets its power and voltage and it will be done by the electromagnetic induction it can also be called as a transformer with a rotating secondary and thus it may be called as an AC machine transformer type and in it electrical energy is converted into mechanical. A rheostat will be added to the stator and it thus it will reduce the voltage. While the reducing voltage will cause the decreasing of torque too but to supply the load the torque must remain same for this we need to increase the slip if the slip increase motor will run at a reduced speed. 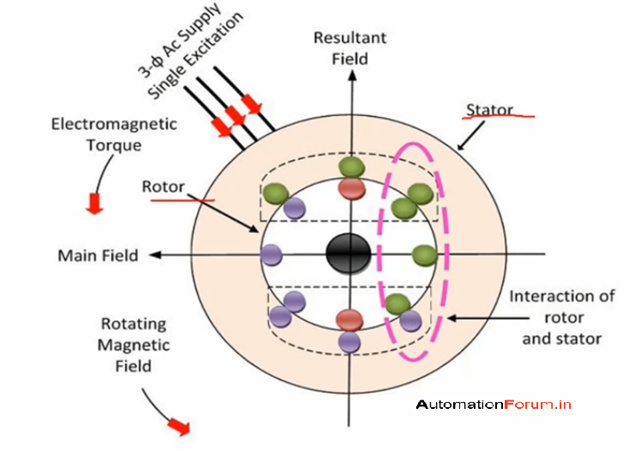 In order to control the speed external resistance is added to the rotor and thus we can reduce the speed but while doing that the torque will decrease too so we need to increase the slip which will decrease the rotor speed.